I recently found myself in a retail store with a lot of kayaks. Most of them were recreational kayaks, and you know how I feel about recreational kayaks. 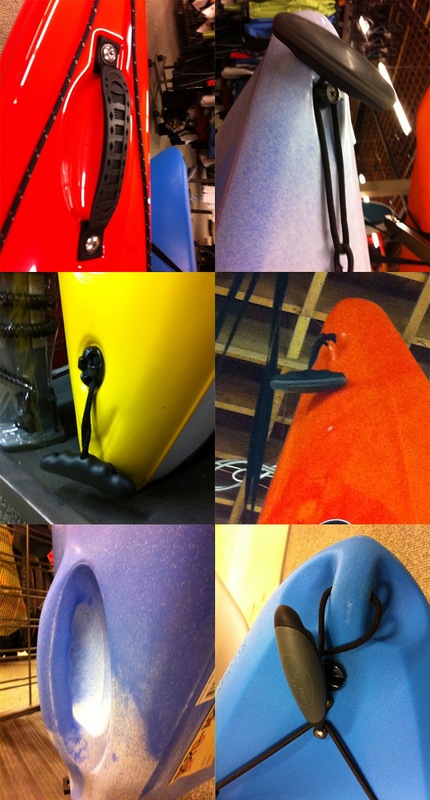 I noticed how boat designers have gone to great lengths to change up the handles on bow and stern of their kayaks. The upper right is the weakest of the three. I give it one summer of hard kayaking. The strongest is the bottom left as it is molded directly into the hull of the kayaks. the middle two are pretty good, in that they are 'close' to doing what we actually need it to do. But, I can hear you say 'do what we need it to do? It's a handle, It's for lifting the kayak!' Well, yes and no. These handles are clearly designed for lifting the kayaks. But believe it or not it is not what they are designed to do. When I worked for the school in Alaska, the first thing we taught students was that to lift your kayak you ignore the handle, and lift the hull of your kayak. In part this was because so many students moving through the school created a lot of wear and tear on the kayaks, But the bigger reason was handles aren't for lifting. I do lift my kayak by the handle, but usually just to get it off the ground, and then I grasp the hull. When lifting someone else's boat - or helping someone with their boat - I follow their lead and lift their kayak the way they do. So what is the handle for? Well, handles like these are designed as handles. But originally these handles weren't called handles at all, they were called swimmer toggles. they were designed to be long handles that could swing free of the bow or stern if you were rendering aid to a kayaker in the water. Look at how the handle hangs on the bow and stern of this Nigel Denis Explorer. In my opinion they could even be a little longer to keep the swimmer a bit more of a distance away from the kayak. The handle can spin in any direction. Think about holding onto that while in the water, with both you and the kayak moving in rough seas. Now think about doing that with one of the short or molded handles at the top of this page. If you paddle a lot and you lift by the handle you will eventually see the handle or webbing begin to wear. It is always possible to replace the handle when it becomes worn but I actually think it is easier to lift the kayak by the hull. Good stuff. I think we are going through a consumer mania phase where everyone wants a kayak...problem is few know what to look for or what it is they are actually buying. In the end, it's just business. Agreed Silbs. We are seeing big growth in recreational kayaking in the US. I have said many times that most won't seek any form of instruction. It's a shame. I think we have to view it as any growth is good growth, and do our best to help people learn and be safe.